It's much more than a dance, for one! In the 17th century, it was a way of life. "La Belle Danse" as it was called in French, what we call today baroque dance, guided much of social and indeed political life. When we think of "baroque dance", we often think of enormous wigs and frilly dresses, a rond de jambe and graceful entrechats. This is of course true, to a certain extent: as the Belle Danse developed during the 17th century, it was a dance reserved for the nobility and gentlemen, wearing their finest clothes. However, under the reign of Louis XIV, the baroque dance was not only a source of entertainment or a simple pass-time. Quite the contrary, it was a veritable art-form, with a social and political impact. Oh how the nobility danced! In 17th century France, dance was an integral part of a gentleman's education. The nobility learned to read and to write, to handle weapons, and... to dance! A young sovereign in particular became extremely passionate the choreographed arts and spent countless hours of each day practising: Louis XIV, the future Roi Soleil (Sun King). As a child, he studied under many of the greatest teachers available (such as the famous Pierre Beauchamps for example), and at the age of 12, Louis XIV performed on stage for the first in the Ballet de Cassandre. In 1653, the year of his fifteenth birthday, the monarch performed the role of Apollo in the Ballet royal de la nuit, performance during which he was acquainted with his future court composer, Jean-Baptiste Lully. 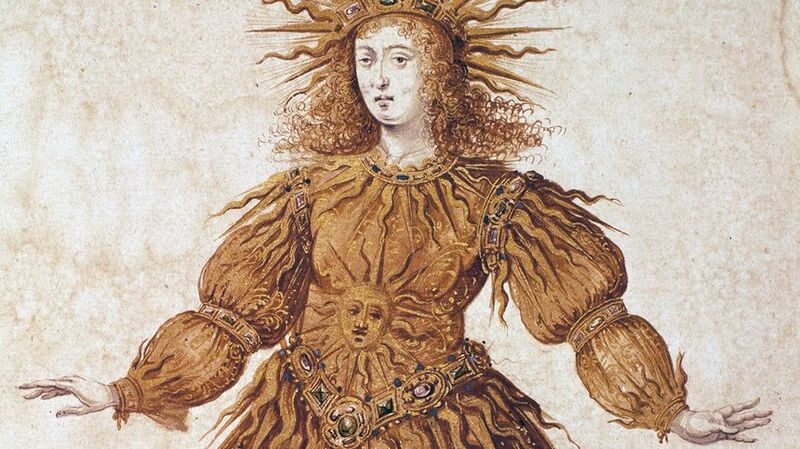 Wearing a golden sparkling costume, Louis XIV appeared on stage much like the Sun, an almost divine apparition; his performance left none undecided as to the young monarch's talents. Le roi Louis XIV dans son costume de Soleil pour le Ballet de la Nuit, en 1653. © Getty / . Since the king was an enthusiastic and passionate dancer, so it was to be for all members of his court. Never had the choreographed arts been so encouraged as under the reign of Louis XIV. Men and women of high standing gathered regularly at the organised social balls, to dance courantes, sarabandes, menuets, chaconnes... It was important to have mastered them all, for the slightest mistake was costly for one's reputation. Louis XIV now occupied the entire stage, no longer accompanied by several gracious courtesans but rather the best dancers and performers available. The Académie Royale de Danse was founded in 1661 solely with the dissemination of knowledge and the obtainment of perfection in mind. But what did it look like? An instrument of politics and a highlight of social life… But what did baroque dance actually look like? How could one recognise its steps? "This dance is built upon the premise that if you can walk, you can dance", explains choreographer Béatrice Massin, advisor to director Gérard Corbiau for the film Le Roi Danse (2000). "Everything is built from very simple elements since the ball dances were necessarily accessible to all, nobody was a professional at this time." "The baroque body was a round one, fully capable of taking advantage of the space", adds Massin. "A body that takes pleasure both in volume but also in height. On every strong beat, for example, the body rises." "There is a particular way of using the arms since the shoulders were not free when wearing court costumes. In the baroque dance, the ports de bras [name of a general arm movement in dance and ballet] thus remains oriented towards the pelvis and the lower part of the body, whilst the bust stretches upward, as if to assert grandeur and ease. As for the steps, the premises of classical dance with entrechats, chassés, and pas de bourrée... All variants that were built from a walking step. The year 1670 was a pivotal one in the history of French dance. Having accustomed his court to regular performances, Louis XIV suddenly abandoned the stage, deciding to never dance in public again. Only for the comedy-ballet Les Amants magnifiques, created by the famous duo Molière/Lully, that the king donned one last time his costume of Apollo. Why such a decision? Several theories have been elaborated by researchers and historians... Now in his thirties, it is possible Louis XIV believed he was no longer up to the task, that he could no longer perform his steps with the usual dexterity. According to another hypothesis, the "Sun King" wished to distance himself from the people: not everyone should have the opportunity to see the kind dance. He is a god, and meeting him should be a privilege. However, the sovereign did not abandon his love for the arts: until the end of his reign, he passionately encouraged and promoted French artistic creation. And since the stage had been abandoned by the king and his nobles, there was now room for other artists to take to the stage... Gradually, musicians and dancers thus began perfecting their crafts, specialising and becoming professionals, and the Académie Royale de Danse eventually became the Ballet de l’Opéra national de Paris [the Paris Opera Ballet]. "We were able to find almost 300 choreographies with this system of notation", adds Massin. "However, it is still not enough to understand this dance, it is also a entire context that we are trying to revive and understand. We build our understanding upon treatises, paintings, sculptures, and music of course..."
It is not because baroque dance belongs to the history, its origins rooted in the past, that it is no longer a living art-form. For example, Béatrice Massin wishes to create new links between the older choreographies and those of today, uniting baroque and contemporary aesthetics. "With my dance troupe Fêtes Galantes, we are constantly creating. We begin by using baroque elements, or baroque music, and attempt to identify the possible parallels between the anatomical principles of baroque dance and our contemporary practices." Today, both amateurs and professionals happily re-enact the dance balls of the past, dancing the menuet or the chaconne following historical tradition. As for the Classical dance, it bears witness to the legacy of the great choreographers of the 17th century, such as Pierre Beauchamps who formalised the famous five positions. However, part of the baroque movement is also trying to update this Baroque art, to reclaim it, and according to Béatrice Massin, "there is still a huge amount of work to do to brush the dust off of this style of dance".